Have you decided to give up ‘red meat’? If you are simply replacing ‘red meat’ with chicken, fish, eggs or dairy, you could end up causing more suffering for animals than before. If you consider yourself to be a compassionate person, then please take a moment to see how you can make your food choices count for animals. 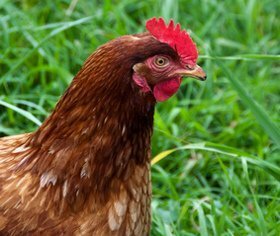 If you switch from ‘red meat’ to chickens you will be responsible for the death of more than 217 other sentient beings. That means more individuals will be subjected to breeding, confinement, mutilation and slaughter. Chickens are sentient beings just like any other animal. Every chicken is terrified on the kill floor. Hens and roosters exhibit tremendous joy at the hatching of their chicks. 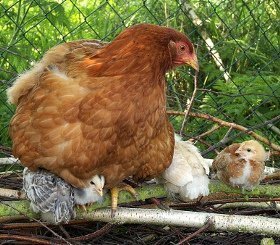 Hens are capable of forming strong bonds with their family as well as their human guardians. The life of each chicken is valuable. Perhaps you have decided that fish are cold blooded creatures and are less worthy of your consideration? 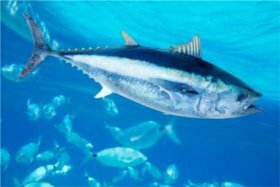 The most popular fish consumed is Albacore Tuna. If you decide to give up ‘red meat’ for tuna you will be killing more than 112 other living beings; literally ripping them from the ocean to suffocate, be eviscerated or frozen alive. Fish are sentient beings. They have a nervous system and their bodies release neurotransmitters similar to human endorphins. They are physically designed to experience emotional and physical suffering and/or joy. Their lives matter to them, they need to matter to us. The egg laying industry is renowned for unthinkable cruelty and provokes a gamut of welfare campaigns. Yet even people who are repulsed by the idea of eating animal flesh will think nothing of consuming eggs. The sad truth is that this action will result in the death of over 97 more animals than before. To the hens, their eggs are their offspring. Whether the eggs are fertilised or not, their overriding desire is to sit on their nests and witness the miracle of their chicks being hatched. The eggs belong to the hens, not to us. All eggs and dairy products come from grieving mothers who themselves are ultimately slaughtered. Cows’ and hens’ reproductive organs and processes are violated repeatedly. Their recurring instinctual drive and emotional yearning to be mothers, is consistently frustrated and mercilessly exploited. All their calves, and all their potential chicks are stolen. When you choose to replace ‘red meat’ with eggs and dairy products, you are compounding the suffering of these mothers because they live far longer than animals bred only for their flesh. The tortuous life of an egg laying hen endures for an agonising 12 months of unnaturally maximised egg production. Broiler chickens reach slaughter weight in only 6-8 weeks. 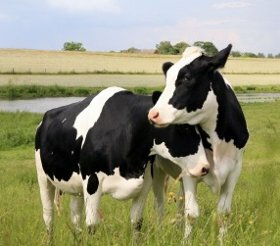 Dairy cows are kept alive for 6-14 years. Their existence is a nightmarish annual cycle of being pregnant for 9 months, lactating during their pregnancy, giving birth, having their calf removed, continuing to be milked while grieving for their lost calf, and then being forcibly impregnated all over again. Beef cattle reach slaughter weight as early as 6-18 months. Omnivores directly consume about 85 animals a year. However, the number of animal deaths omnivores are responsible for is exponentially larger when you consider the trillion tons of sea creatures who die as bycatch; the downed animals who couldn’t walk onto the kill floor; and the billions of other animals who suffered to death in the agricultural industry. Taking these figures into account, a vegetarian saves on average 406 animals every year. Imagine if you included the millions of male egg-laying chickens who, because they will never lay eggs, are killed after hatching. Consider also the bob calves who are shot at birth due to being a byproduct of the dairy industry. Thus as a vegan you will save even more lives. When one person is applauded as a hero for saving a dog from drowning, shouldn’t saving over 400 animals every year be seen as a remarkable achievement? If you live another 40 years as a vegan you will save over 16,200 animals. Now that is a reason to celebrate! How many animals will you save if you live to be 80 years old? Yes, it is a good idea to start saving animals right away by giving up ‘red meat’ completely and, as you can see now, not by replacing it with chicken, fish, eggs or dairy products, but by replacing it with delicious vegan meals. However, you have no time to lose. 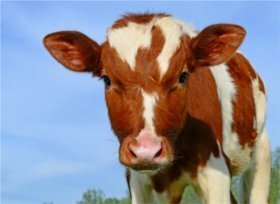 If you simply replace all of your current ‘red meat’ consumption (ie you never eat ‘red meat’ again) with 34 Vegan Days a year, it will take you 15 years to save 1 cow. Yes, when the life of even one sentient being is valuable, then that gesture is a start. However, to make a real difference you need to start today, by replacing all of your ‘red meat’ with at least 1 Vegan Day a week. 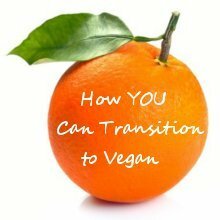 Here are some tips on how you can transition to being vegan at your own pace. You will also start feeling so much healthier right away! 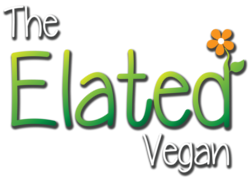 Feel free to contact me if you need further information, or are looking for support and advice on a vegan lifestyle. Note: the terms ‘red meat’ and ‘beef’ have been placed in quotation marks to show that these are unacceptable, derogatory terms which reduce sentient cattle to resources and facilitate the trading and consumption of their body parts. In the interests of simplicity the usage of the term ‘cow’ in this post is not necessarily gender specific, but rather refers to the singular of cattle.